How To Clean Clogged Sprinkler System? Often, we find that the spray heads of our sprinkler system tend to stick up, when they should retract back down. In reality, this is a common issue among many sprinkler system models after a period of use. We should the age of the sprinkler heads. Wear and tear may already develop after 3 years of usage or more. There could be rough edges that may keep the spray head to stick up. The riser will wear more easily if the soil has higher sand content. The only way to solve this problem is by replacing the spray head and in order to ensure longer service life, we should make sure that the sprinkler head has stainless steel riser. This device should last much longer, although they can be a little bit more expensive. We also need to check whether there’s dirt that enter the sprinkler system. There could also be sediment in the well or water source that cause problems with the sprinkler system. Before replacing the head, we should check whether the problem can be addressed by only cleaning it. In this case, we should step down on the riser, while being immersed in a bucket of water. Let the head running by turning the water on. Let the head pop back up and we need to step on it again. We may need to perform this for a number of times. Then, we should turn off the sprinkler system and check whether the spray head still sticks. With this simple cleaning method, we should be able to clean out dirt and debris from the sprinkler head and around the wiper seal. The quality of water has huge contribution on whether your sprinkler system can be frequently clogged. You should check whether your water source has relatively high iron content and you also need to check it for the amount of debris. 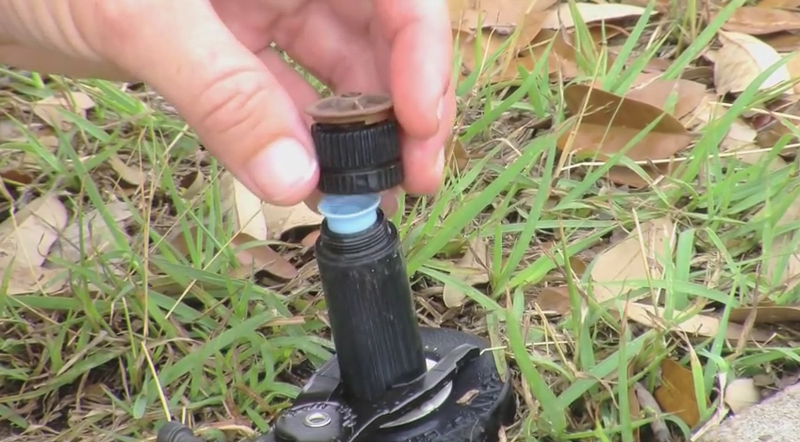 If your water supply is dirty, the nozzles can get clogged and the heads may stick fairly quickly. If the sprinkler system in your lawn tend to get clogged, it is important to flush it out, so you will get better results. Check the spray heads and see whether you can remove the screens and nozzles. Then you should install the flush caps and run water through the entire system. When you buy the spray heads, they should come with flush caps. If you don’t have the flush cap, you should still be able to completely remove the head, pull up the swing joint and finally flush the whole system. Even so, you should be aware that it’s not the same with blowing out or draining your system. On older sprinkler systems, the spray heads are often not installed on the swing joint. In this case, all you can do is to examine the riser that is usually made of hard PVC. Just make sure that there’s no dirt that can flow back in the pipe, while it’s flushed, so the system won’t get clogged again.